(Pronounced “fur”) I was introduced to this wonderful Vietnamese derivative of noodle soup when I took up a position in Saigon (Hi Chi Min City). On my first day in the city I was taken by a local colleague to Restaurant Pho Hoa Pasteur on 260C Rue Pasteur, Saigon. Parked outside of this extremely local and packed noodle shop were both brand new Mercedes and local worker’s bicycles. We sat down at a communal table that was laden with every conceivable type of green leaf, bean sprouts, cilantro, Thai basil, sliced chili and lime wedges as well as hoi sin sauce and hot chili sauce. 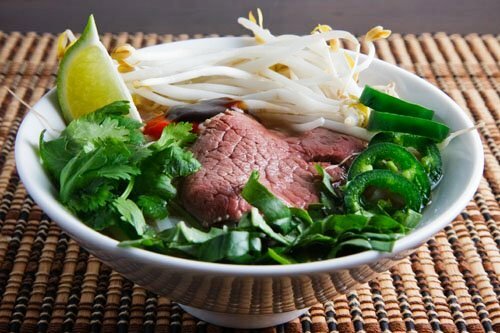 Before long we were presented with bowls of hot steaming beef broth and rice noodles, scented with star anise, Thai Basil, caramelized onion and ginger. We inhaled the perfume and slurped up the noodles and broth, gradually adding to the bowl from the array of condiments and greens with squeezes of lime juice. Truly poetry in a bowl! 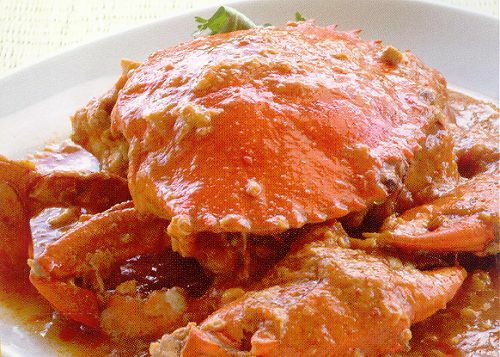 Singapore chili crab was invented in 1950 by the owners of Palm Beach Seafood Restaurant, Singapore. I first visited Singapore in 1973. This was my first adult venture into Asia and at this time Singapore was just being transformed by Lee Kwan Yew into the first vestiges of what would become the economic and sometimes squeaky clean financial and cultural powerhouse it is today. Never the less the fabulous culinary heritage and merging of Asian food cultures in Singapore was then and still is today the best in all of SE Asia. I was introduced to chili crab some years later on my next trip to SE Asia. It blew me away. I had really never tasted the sublime subtleties of Peranakan or Nonya cuisine until then and the spicy, aromatic and sensuous qualities of the dish embodies all of the characters one associates with this unique fusion of Chinese and Malay cuisines. I never miss a chance to savor this magnificent dish whenever the opportunity arises for me to visit Singapore. An experience for true foodie bliss …! Always copied but never mastered unless prepared and eaten in Singapore. A succulent poached hen commonly referred to as Báijī or “white chicken”, quartered and served with chicken broth and fragrant rice that has been cooked in the same chicken broth with sprigs of coriander leaf, sesame oil, and accompanied by a delicious garlic-chili dip and special thick soya sauce. Hainanese Chicken Rice probably evolved from Hainanese immigrants to the region. 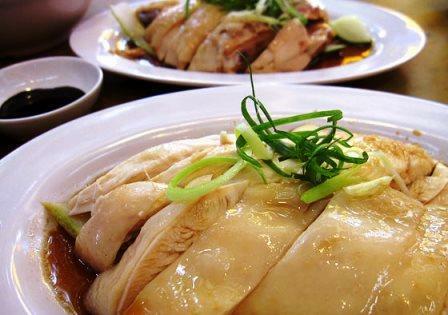 The dish is said to have been popularized in Singapore in the 1950s by Moh Lee Twee, whose Swee Kee Chicken Rice Restaurant operated from 1947 to 1997. So iconic is chicken rice to Singapore that it has been elevated from a common hawker peddler’s dish to the status of national dish served not only in every hawker market but in exclusive luxury hotel restaurants and department store food halls. I believe I actually tasted my first genuine Singapore Chicken Rice in about 1995 when I was a trainee executive chef sent to the also iconic Grand Hyatt Singapore for cross training. Almost identical to the Singapore original it will come with a garnish of cucumbers and occasionally chicken cake and fresh coriander, fragrant jasmine rice cooked in broth and a bowl of clear chicken broth. As with all great dishes the secret in the simplicity is in the freshness of the bird and the almost scientific approach to preparing, poaching and serving the dish. No substitutes accepted. Pure culinary pleasure. Could anything be more ironically French than onion soup? Probably not but then there are so many other iconic French dishes that it would be hard to choose the ultimate one. 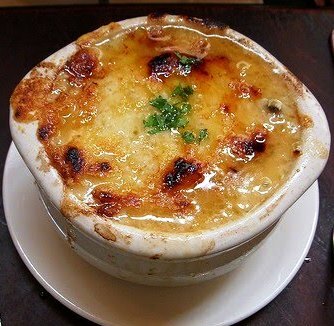 Soupe à l’oignon is an onion soup based on beef broth with caramelized onion traditionally served with a thick melted cheese and crouton topping. While being age-old in origin and seen as a food of the poor, the modern version of this soup underwent a resurgence of popularity in the 1960s in great part because of the efforts of pioneering chef, cook book author and television cooking show host, Julia Child; who introduced to the average home cook classic French cuisine. I was lucky enough to have tasted the authentic French onion soup at the famous Au Pied de Cochon restaurant in Le Halles, Paris. Operating since 1947 the Pied de Cochon embodies all that is iconic about classic French cuisine. The soup was just as one would imagine the authentic soup to be, a rich meaty and oniony stock with slow-cooked caramelized onions, topped with crusty bread and lots of toasted cheese. 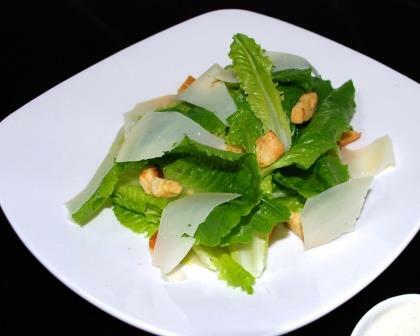 Caesar salad is probably the most popular and the most re-invented salad in the world. It features on just about every restaurant menu but most people rarely know the exact origins of the salad. Its conception is usually credited to a restaurant owner named Caesar Cardini, an immigrant from Italy who owned a restaurant in Tijuana, Mexico. The legend goes that during the alcohol prohibition restrictions in force in the USA at the time his Tijuana restaurant was a favorite haunt of Americans who would cross the border into Mexico to be able to eat and especially drink alcohol with the restrictions. It is said that Cardini invented the dish when in 1924 over the American Independence day holiday a rush of diners descended on his restaurant and exhausted the kitchen’s supplies. Cardini made do with what was still available in the kitchen thus a salad and a culinary legend was born. Since that time this salad has been adjusted and added to by countless chefs to suit their own style or culinary visions but the original is still the best. The original Caesar salad recipe had no anchovy; the anchovy flavor comes from Worcestershire sauce and also included only whole Romaine lettuce leaves, coddled eggs, olive oil, garlic, lemon croutons and parmesan cheese. It was always also tossed and served tableside. To tell the truth I do not recall when I first tasted or attempted to make this salad but I was aware of the story of its inception and where ever have had the authority over how the salad is made and served I have always insisted that it stays true to the original. The first Peking Duck restaurants in Beijing date from the 14th century and the dish is now considered a national dish of China. The whole process of rearing and processing the famous Peking ducks for the dish is an art form that has been passed down through the generations. The absolute crispiness of the duck’s skin is created in a process lasting days that involves pumping air under the skin, air drying and suspending and roasting the ducks in special wood fired ovens. 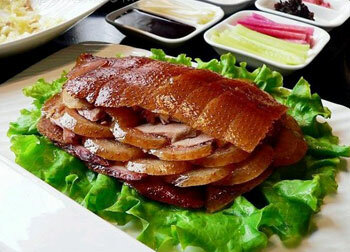 The largest duck restaurant in Beijing is called Quanjude, serving over 5000 ducks a day. Massive, full of noisey family groups, tourists and foodies, typically Beijing, it has to be seen to be believed. I have eaten their on quite a few occassions during my tenure at the China World hotel. This is a meal that must be eaten with a group of friends. First the duck is wheeled out on a trolley and the chef deftly slices off the crispy skin and tender meat. The carcass with any left over meat is taken away and turned into duck soup and stir fried duck meat with vegetables which is served back to the table. Everyone takes a thin Mandarin pancake, smears on some plum sauce and builds up a layer of spring onion, cucumber, duck meat and crispy skin. The whole thing is folded up into a parcel and popped into the mouth…delicious! A French classic, that is served all over the world, the original fast food of the fishermen and one of the simplest dishes to cook at home. 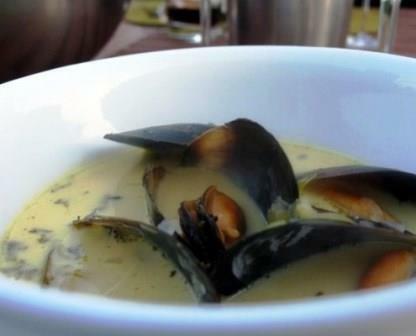 As with all shellfish dishes it’s all about the freshness of the mussels. The mussel should be shiny, tightly closed and any mussels that are not should be discarded. There should be no “fishy” smell. Even though this is a classic Normandy dish actually the first ever time I tasted it was in a small town just outside of Lyon. I don’t even recall the name of the town but it was an ancient walled town and as we walked through the gates and into the town square we stumbled across a farmers market or Fete. Farmers from all over the area had brought in their products and the town was celebrating their produce with stalls of fresh foods and regional dishes, food competitions and wine tasting. After sampling a variety of local blood sausages, cheeses and pastries we had worked up a real appetite. Down one of the streets we came across a typical looking bar/café with a lively crowd of local people and farmers drinking and eating. This was the start of one of the simplest but most memorable meals I can recall. Basically the food offering that night was massive bowls of steaming mussels in white wine and cream with freshly baked crispy baguette for mopping up the juices and a bottle of the freshest and crispiest white wine I have ever tasted. The wine was young and local from a bottle that didn’t even have a label. The mussels were so delicious that we immediately ordered another bowl. And I mustn’t forget the dessert, freshly baked Tart Tatin…a meal legends are made of. I have eaten this made by little old ladies sitting on the floor of the streets of Bangkok, in small open air restaurants down a narrow soi (alleys) and in fancy hotel restaurants. Eaten with sticky rice. 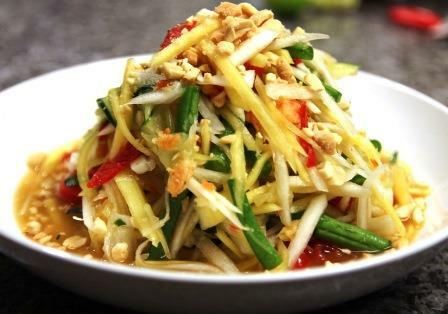 Nothing can match the flavor and simple beauty of this salty, spicy, sour and sweet original Isan (north eastern) Thai staple. These are only a few of the fantastic iconic dishes I have tasted in their natural environments. These dishes are all very diverse — historic and modern, delicious or an acquired taste. The list could go on and on and suffice to say that I have only scratched the surface of iconic dishes. There are many more that I hope to discover and taste.